‘We done this show for the telly people. Where are the telly people?’ proclaim Robin Ince and Michael Legge, before launching into a wonderfully biting critique of mainstream culture…including students and Facebook. But it’s not one of those shows; this is cliché-free comedy, with inventive ideas and captivating execution. It’s crafted chaos from start to finish, with large moments of audience bantering punctuated with dashes of slick, prepared material. 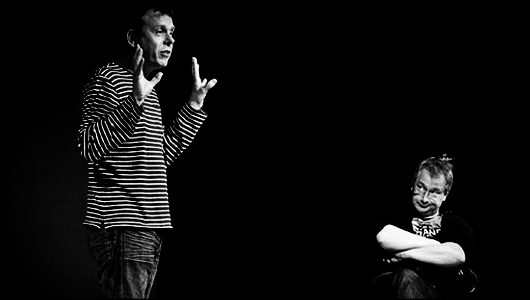 Of course the show isn’t without its lulls – the ‘Angry Heroes’ section, for example, offers an arduous set-up for such a small pay-off – but Ince and Legge deliver at such a pace that moments of silence provide a welcome rest for a crowd partaking in such a communal stand-up experience. That sense of shared ire – righteous ire? – is perhaps why the show is such a success. We all love to moan, to complain and to protest about mundane things like escalator etiquette, gap years and morris dancing – and here, at The Stand V, Robin Ince and Michael Legge fight for our right to pointless anger. What a joy. Date of live review: Thursday 11th August 2011. I saw the original ‘Pointless Anger, Righteous Ire’ at the GRV in Edinburgh last year and it very much sounds like Legge and Ince are just as angry, if not more so! I’d have easily gave them five stars for their performance in 2010 (not just because they were handing out cake and whisky in the early afternoon) and it seems the sequel has carried on how it began. This makes me wish I was in Edinburgh deeply!